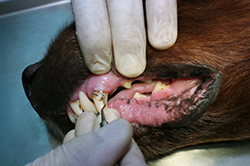 At Renfrew Animal Hospital our veterinarians will do a thorough examination of your pet's mouth to look for signs of periodontal disease, such as gingivitis (inflammation or infection of the tissues around the tooth), tartar, loose or abscessed teeth, and/or other abnormalities. In some cases, a dental cleaning may be recommended. This procedure is performed under general anesthesia and involves a thorough dental evaluation as well as dental scaling and polishing. If a tooth is diseased it may require extraction (removal). Often dental radiographs are required to examine the root of a suspect tooth and to check the health of the surrounding tooth roots.